Giga Mac in Super Smash Bros. for Wii U.
Giga Mac (ギガ・マック, Giga Mac) is Little Mac's Final Smash in Super Smash Bros. 4 which transforms him into his hulking alter ego known as Giga Mac. 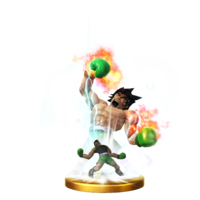 Giga Mac can be freely controlled, moving and attacking normally with a moveset similar to Little Mac's. In SSB4, Little Mac flashes in a ball of green light before transforming into a hulking form known as Giga Mac. He retains the same moveset, but with a considerable upgrade in power and reach, along with a mobility increase. His smash attacks in particular can deliver high amounts of damage, and offer incredibly high knockback scaling (except for the low angled forward smash, which still deals low knockback), capable of KOing most of the cast below 40%, with the forward angled forward smash being capable of one-hit KOs. Only four of Giga Mac's attacks have different attributes compared to Little Mac: namely, his neutral infinite is significantly slower but deals more damage, his forward tilt transitions to the second hit slower (though the move's effectiveness remains unchanged), the charge time of Straight Lunge is reduced by half, allowing it to be fully charged in under a second, and Slip Counter's counterattack deals a minimum of 30% damage while still possessing the 1.3x damage multiplier. Giga Mac has the fastest air speed of all fighters (including the other transformation Final Smashes), despite Little Mac's below average air speed. He also has the fastest walking speed of any fighter, but his running speed is only increased enough to surpass Captain Falcon; he still loses to Sonic and Wario-Man. Giga Mac's aerial attacks also gain a damage and knockback boost; while they are still considerably weaker than Giga Mac's grounded moves, they become capable of KOing at the 90-100% range at the edge of Final Destination. Like Giga Bowser, Giga Mac cannot be launched, does not flinch when attacked, and cannot have his shield broken, but he can still receive damage, and can still take knockback from windboxes. Additionally, Giga Mac is unaffected by Super Mushrooms and Poison Mushrooms, making it impossible for players to alter his size during a match. Likewise, Metal Boxes also have no effect on Giga Mac. While Little Mac is under the effects of Giga Mac, his Power Meter is temporarily disabled and Doc Louis will not call out during Giga Mac's taunts. Giga Mac reverts back to Little Mac after 11 seconds have passed. This Final Smash turns Little Mac into a hulking monster of a man. In Punch-Out!! 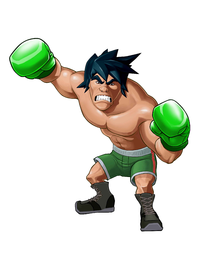 for Wii, Little Mac could take this form by building up the gauge with some well-timed blows. In this game, it seriously powers up his attacks and makes him even faster. He'll completely dominate on the ground, but air battles are outside his weight class. In Punch-Out!! for Wii, there is another Giga Mac color scheme used by the brown haired Little Mac controlled by the second player. However, in Super Smash Bros. 4, Giga Mac only has one color scheme regardless of the costume that Little Mac had prior to using the Final Smash, like other transformation Final Smashes. Little Mac beginning his transformation. In the E3 2014 Super Smash Bros. for Wii U demo, due to a glitch, if Giga Mac touched a spring, he would be stuck in his bind pose for the remaining duration of the Final Smash. While the transformation is a size increase for Little Mac, Giga Mac is actually only slightly larger than Bowser. Since windboxes still affect Giga Mac, it is possible to KO him off the upper blast line (such as with Greninja's down taunt when Giga Mac is in the air); however, since he does not have a screen/star KO animation, this will always result in a blast KO. Even though Wireframe Mac uses 8-bit sound effects for his "voice", Wireframe Mac still emits the vocal sound that Little Mac emits upon transforming, and still has the default Giga Mac texture. 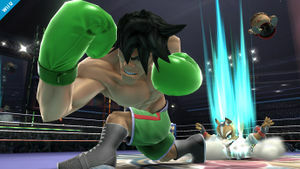 However, the sound effect that plays when Little Mac begins transforming (during the ball of green light) is completely removed in Super Smash Bros. for Nintendo 3DS. Aside from the obvious technical reason, Giga Mac not having a wireframe variant might be because the transformation was introduced in the Wii version of Punch-Out!!. Interestingly, the speed multiplier of Training Mode does affect how long Giga Mac lasts, despite the fact that his duration formula is the same as that of Wario-Man and Mega Lucario. Doc Louis won’t be heard while taunting as Giga Mac. This page was last edited on March 21, 2019, at 20:34.